How long have you been widowed? Days? Weeks? Months? Years? In the first hours it seems like you cry non-stop and you never expected it to hurt like this! Like you're flooded. You didn't know you had so many tears. Then you get a repreive. You only cry a couple times a day. After a week or two, a couple times a week. Sooner or later--there is no schedule, each goes at her own pace--the crying gets down to a couple times a month . . . a couple times a year . . . These crying jags are like labor pains in reverse. While labor pains start out mild and far apart, grief starts out painful, fast, and intense. The next round of "grief pains" are a few seconds shorter, a little further apart. They still hit, but most of the time each new round is a bit diminished; they are a little weaker. Or perhaps you're a little stronger. Brace yourself for birthdays, holidays and anniversary pains. Like labor pains, you know they'll come. Prepare for the wave. But these, too, will become easier to bear. If the "Grief pains" have done their job well, like birth contractions, something new has been born. When the tears diminish, don't think it's because they've dried up or you've become numb and indifferent. Tears have watered you like raindrops, and you've grown and transformed into the resilient, fruitful orchard of a woman that God had planned all along. 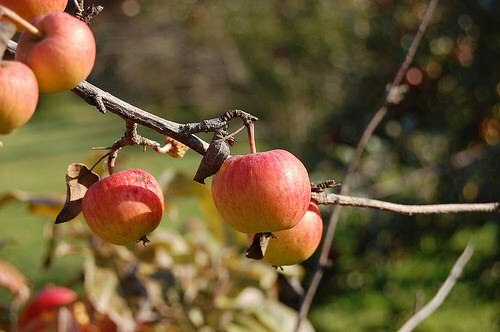 When we look at an apple, we see a piece of fruit with seeds. When God looks at an apple, He sees an orchard. I heard that the other day. It's true, isn't it? I think God sees an orchard when He looks at widows, too. You might think He sees just an ordinary woman, but I think He sees the real you--the courage, resiliance, and faith. God also sees the legacy of blessing--the seeds--you'll leave for future generations by the choices you make today. There is a lot more "fruit" to be produced in your life, and many more "trees" to grow which will provide the shade of God's goodness to the world because of you. What sort of plans do you think God has in store for you? Thank you for this encouraging and uplifting post. Thank you for this post. Such a beautiful reminder that God still has a plan for me in this journey. A journey describes this chapter of life very well, I'm grateful for the travelers who meet at this resting spot along the way. May God bless you all, Ashleigh, Mrs. Mac, and Flower Lady Lorraine. You're all an inspiration to me.